2011 Acabion GTBO 600 Daytona-VI. Picture credits - Acabion. Submit more pictures. The Acabion provides an increase of + 1 000 % in efficiency already in slow city traffic and even more at high speeds, plus it offers speeds up to 600 km/h on automated an elevated long distance tracks and even a drastically outranging of super�sonic jets at 20 000 km/h in future intercontinental maglev vacuum tubes. Price as new (MSRP): Euro 3000000. Prices depend on country, taxes, accessories, etc. Frame type: Carbon fibre and titanium monocoque. Comments: Water temperature-conditioned li-ion batteries. Range: ) 500 miles (800 km) per charge. 110 V as well as 220 V charging. Electronically limited Acceleration 0...525 km/h (326 mph) in less than 30 seconds. Projected Area: 0.66 m2 Aerodynamic Drag Coefficient cd=0.09. Rolling Resistance Index cr=0.006. Total Effectiveness = + 1350% compared to fully electric cars. German project. Ask questions Join the 11 Acabion GTBO 600 Daytona-VI discussion group or the general Acabion discussion group. Get a list of related motorbikes before you buy this Acabion. Inspect technical data. Look at photos. Read the riders' comments at the bike's discussion group. And check out the moped's reliability, repair costs, etc. 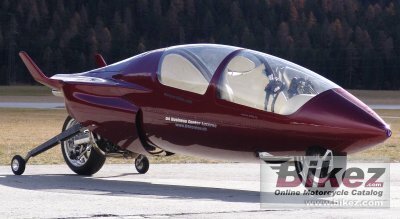 Show any 2011 Acabion GTBO 600 Daytona-VI for sale on our Bikez.biz Motorcycle Classifieds. You can also sign up for e-mail notification when such mopeds are advertised in the future. And advertise your old MC for sale. Our efficient ads are free. You are also welcome to read and submit motorcycle reviews.